This beautifully fragrant, port-style dessert wine is produced from estate grown black sweet cherries, fortified with our own cherry brandy, and sweetened with tart cherry juice. It is then barrel aged for nine months in American oak. Ripe black cherry fruit, combined with mildly toasted oak, and the warmth of brandy, for a delicious port like rendition. This is the perfect accompaniment for rich chocolate desserts. Add to your chocolate bread pudding recipe with a hint of cinnamon or simply pour over ice cream. Your favorite recipe for barbecue sauce will come alive, and a bit in a jerk marinade will work wonders. Sharp cheeses like Bleu and Romano love this product. Our distillation operation allows us to create some wonderful port-styled wines while incorporating our local fruit. This is no exception. We consider this to be one of the best ways to preserve black cherries! From Beth O. of Shelby, Michigan on 10/24/2017 . This wine is so delightful! I love it! 9/13/2017 – I received this wine with my wine club this month and I'm wondering if it's best served chilled ? 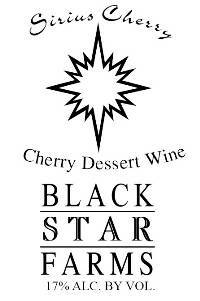 Response From Black Star Farms: Yes, we suggest serving the Sirius Cherry chilled. Try it with chocolate or cheese cake!